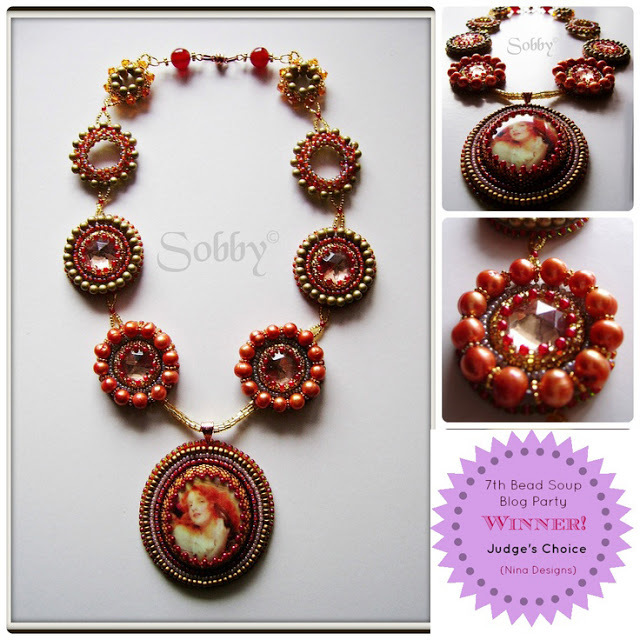 I am truly honored (and pretty confused since it's 2 am here) to announce that my Red Lady necklace is one of the winners of the 7th Bead Soup Blog Party contest!!! The fact that I was chosen by Nina Design together with another amazing artist as Malin de Koning, who I absolutely adore, is already a big prize for me. Please take a moment to look at ALL the winners here, there are 46 of them and all are astonishing creations! -first of all Lori McDaniel Anderson, the mind and body behind the Bead Soup Blog Party - because it takes a whole lot of energy and physical strength to do all that's required for such a big event with more than 500 partecipants, and she made all of this despite a lot of problems. She's a warrior and we all appreciated her big efforts to make this party such an amazing experience for all of us. -Nina Design, one of the jurors who chose my piece, a huge honor I wasn't expecting at all! -my partner Dorota, who sent me that amazing cabochon which led me to bead embroidery in the first place, and a lot of other goodies that stimulated my creativity. Knowing you was a big pleasure dear Dorota, you are such a nice, creative and generous person! -last but not least, my wonderful boyfriend. He often makes fun of me saying "I'm going to throw away all your beads!" but actually always pushes me to explore my creativity and bears the presence of all these tiny little things everywhere. I've become much more tidier with time and we don't find beads in our meals or bed anymore, but still he hears me swearing whenever I accidentally pour beads on the floor, and he still loves me. Thanks for visiting everybody and for taking the time to write kind, thoughtful comments! Ooooo!!!!!! Silvia, im so so happy, you are the winner! Judges were absolutely right and you were my winner, too.Congratulations from all my heart! Brava brava brava! Sono davvero molto contenta x te! Te lo meriti davvero .... adoro questa collana! Congratulations! Beautiful work - love the red, my fav color. A truely beautiful necklace, congratulations on your win!